When you encounter a serious problem with your PC and want to do a system restore for your Windows 10 only to realize that you don’t have any system restore point saved and it’s too late to create any restore point now. 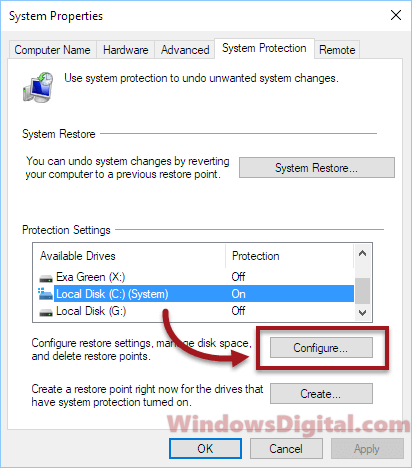 This guide will show you how to enable System Restore in Windows 10 to start creating restore point. Just so you know, by enabling system restore now, Windows will start saving restore point from the time you turn it on and onward. If you do a system restore after that, your Windows 10 will be restored to the point where it was saved. So, if you are thinking to create a system restore point now after a disastrous event, so that you can restore to it, it won’t make any sense and will only restore your Windows 10 to the point where the disastrous event already happened. If you don’t have a system restore point, your best bet would be to reset Windows 10 to factory default. 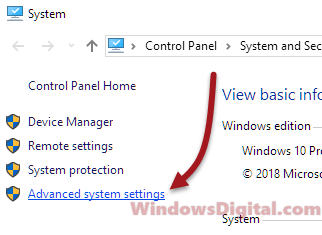 System restore is enabled by default in Windows 10. In some cases, users found that the system restore was disabled and they didn’t know why. So, it’s important to check if system restore is turned on in your Windows 10 PC, otherwise enable it now just in case bad things happen in the future. Search for System and open it. Click Advanced system settings from the left panel. Click on System Protection tab. If you don’t have any system restore point, the System Restore button would be greyed out. 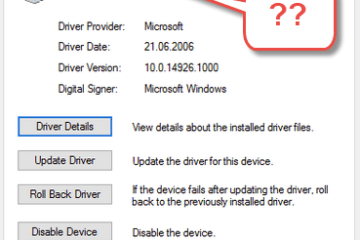 Select your system drive, usually the C: drive. Click to Turn on system protection. Under Disk Space Usage, pull the max usage to your preferred level. This is the amount of space that will be assigned for system restore to create restore point. Just set a comfortable amount of space that you can afford to spare. The more you allow, the more restore points it can create. 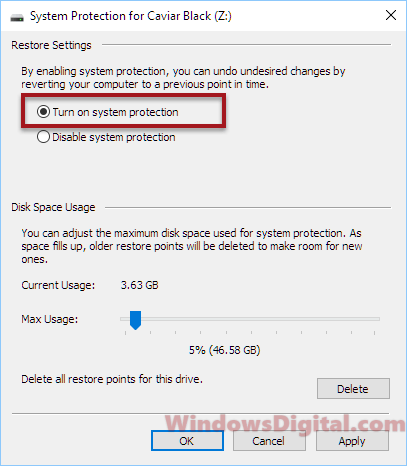 When System Restore is enabled, it will immediately create its first system restore point. It will create more restore points from time to time. When the restore points created exceeded the amount of disk space allowed, the older restore points will be replaced. A side tip: If you run out of space and want to squeeze some space from your HDD, deleting the restore points could tremendously free up your disk space. 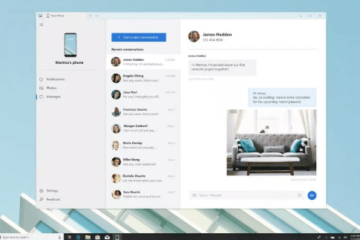 But again, doing this will risk not being able to restore your Windows when needed. So, delete restore points only when you think you won’t need them. 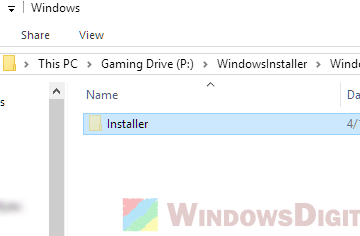 However, if you have enabled system restore in Windows 10, it will still continue to create newer restore points even if you remove all restore points. To delete restore points, follow the steps above to step 7, then click the Delete button that reads delete all restore points for this drive. 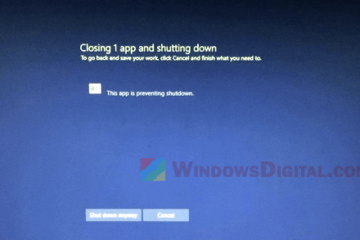 To restore Windows 10 to a previous date, read: How to system restore Windows 10. 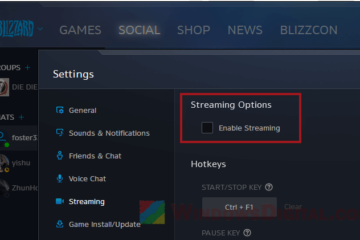 Description for sharing: How to turn on and enable System Restore in Windows 10 to allow it to start creating and saving system restore point automatically from time to time. It's important to check if System Restore is disabled unintentionally.